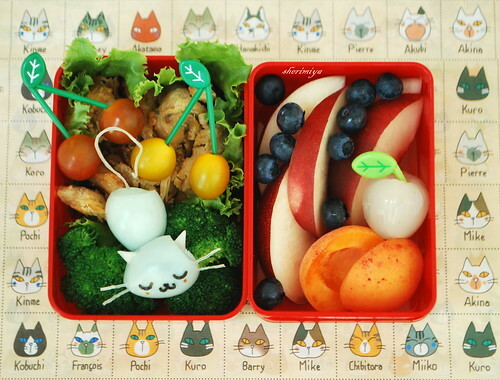 Napping Kitty Bento, originally uploaded by sherimiya ♥. Quick-baked chicken bites get packed in a lettuce leaf wrap next to some steamed broccoli, tiny heirloom cherry tomatoes and a sleeping quail egg kitty. I tried to make a gray kitty using blueberry juice for fun. I should have let it sit longer in the dye but I ran out of patience. I added nori facial details, radish ears, rice stick whiskers and tail, and a teeny spot of sriracha for cheeks. This is a single quail egg cut in half. I was happy to find a curly tail; isn't it cute? Fruit tier has white nectarine, blueberries, homegrown apricot and lychee. You may be asking, is this box new? Nope; I've had this urara box for a long time just sitting in my cabinet. I also have the onigiri snack set too (and the matching fork, come to think of it). I really don't know why I never used it, but I'm using it today because I just got a new insulated tote bag for my boy, and it's tall and narrow. The stainless and 3-sectioned bento boxes I usually use won't fit in it, so I find I'm having to dig these two tier boxes out and give them a try. What do you think? I love it!!! And I just sneezed like three times but I don't think I'm allergic to your blog. Ah Choo! That's a relief! My kitty's hairless so he's not the culprit. Awww... this kitty looks so content! Lovely fruit combo, perfect for a summer lunch. I'm loving that kitty background. What is it? Thanks Debra; funny I knew you would love a kitty bento... The background is wrapping paper; isn't it cute? I stared at them for a long time, hehe. Isn't it true that everyone knows a pet named Chibi? Lovely sleeping quail egg kitty with the curly tail! When I have kids I will make them Bentos, too ^^ Until then I make them for myself. I am sneaking around quail egg for some weeks now... do they really taste like chicken eggs? Love how you use so much fresh fruit! and it looks like seriously, you just picked it. lol. That kitty is so adorable! yes! Tail is super cute too. So glad you DIDN'T make the kitty a dark grey. This colour is so cute! Are the tail and whiskers made of rice noodles? Love it! The cherry stem food picks are great too! I really need to get a good punch for nori faces. The one I have is too big and does not cut really well. Thanks Chaoselfe! Appreciate it :) Quail eggs are so small they don't really have much taste (to me) but you can easily flavor them with shoyu or curry too. Thanks Chantale -- yes, this is why I love summer fruits! So many to choose from and they all look great! Sonoma Bento, they are rice noodles. I like using them because they soften up right away and can be eaten (or not) safely. I think I use those leaf picks every day; I love them so much. The nori punch also helps a lot for making a quick face, but I often hand cut faces too, for different sizes. Thanks a lot! Wonderful! The kitty is so relaxed and has the sweetest face...and the fruits are positively radiant! great use of the two-tier box; sometimes i think it's nice to have the sweet/fruit section completely separate, makes it more like a special dessert. love your kitty - you are always so creative with the natural dyes!! Thank you Lil'chan. I should use it more often. Silly me. Thanks megan. 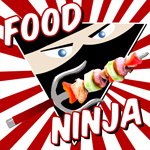 I agree about the separation although there's something about all the food being "together" that speaks to me too. Oh my gosh!! Such a cute kitty, I love it! Your bentos are always so artistic and fun. I wish our kitties were hairless sometimes, lol. That would make cleaning so much easier. And you've proved that a hairless kitty is still a cute kitty!